About four weeks ago, while hustling out the door to the day job, I did the habitual preoccupied squint at my cell phone to see if any messages had blown in on the night wind. Notifications Galore. Double digits coming in on every feed. If I’d had the phone’s buzzer turned on, the device would have rattled its way off the damn table before six a.m. What the hell? January 19. 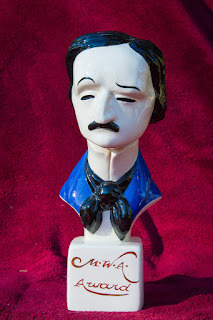 Edgar Allan Poe’s birthday, and the annual announcement of Edgar Award nominations. I’m such a rookie, I hadn’t thought to mark the date on my calendar. Friends in the writing community were claiming my book PAST CRIMES had received a nod for Best First Novel. After a very careful re-reading of the tweets and the texts – and double-checking the Mystery Writers of America website for myself – I held back an extraordinarily loud Howl of Jubilation. The family was still sleeping. I managed to grant them an extra thirty seconds. The rest of that day was a joyous frenzy. When telling family and friends, I would start out explaining that the Edgars are sort of the Oscars for mystery writers. And their usual reply was “Yeah, I know.” I had forgotten that people outside our cabal of plotters and pantsers might have heard of an award whose recipients include authors from Raymond Chandler to Ruth Rendell. Which is a relief. The results are already decided, so all the nominees get to enjoy the time before the awards banquet, without anything more pressing than searching the couch cushions for plane fare or finding a suitable dress (mine is electric blue). No second-guessing, and Thank God no lobbying. Can you imagine For Your Consideration ads for the Edgars? I might mock some up, as a spoof. “Best Mixing of Metaphors”. “Outstanding Fingertip Calluses”. “Best Use of Caffeine and Whisky in a Three A.M. Random Word Spew”. I might be a shoo-in for that one. A month has passed since that morning. While the initial shock has worn off, the excitement remains. My gratitude has only increased. I’ve got a book launch to keep me busy before April 28, but I’m making time to read my fellow First Novel nominees. Not to compare my book to theirs—an impossibility; I don’t know how the MWA judges manage the volume, let alone the decisions – but to admire the range and skill of their writing. It’s encouraging as hell, to read great work and know you’re in that company. And on the banquet night, whatever happens, I’ll celebrate. Howls and all.